The timing of the beginning of the spring term lends itself well to MFL lessons on resolutions, with teaching often focusing on links to healthy lifestyle topics and future tense conjugation. To save you some time, we've found a selection of engaging resources to inspire planning and ease the start-of-term preparation workload. Help your students acquire new grammar and vocabulary with a festive game or a worksheet that involves listening, reading and translation activities. Simple new year resolutions in French. Designed for primary, could also be used for KS3. Two slides at end for worksheet. Print off the strip bingo cards to use in class. French Teaching Resources. The Near Future Tense & New Year's Resolutions PowerPoint & Battleships. The first slide encourages the students to actively engage with the new vocabulary and grammar: working in teams, using their prior knowledge, knowledge of other languages and using a process of elimination to figure out the meanings and rules. They then discuss the pronunciation and question each other before the teacher checks with the whole class. Je vais arriver à l’heure. Je vais faire mes devoirs. Je vais écouter mon professeur. Je vais me coucher de bonne heure. Je vais ranger ma chambre. The next slides have the phrase and a picture. Use this to elicit the pronunciation, the English, the formation and to drill. The next section of slides have multiple choice questions. Then there are "what's missing?" slides. The next slide has pictures of all the phrases. This can be used for a Beat the Teacher game, which the students love! The teacher points to a picture and says a word. If it is the correct word the students all repeat it. If its the wrong word the students must stay absolutely silent. If they do, they win 1 point. If not, the teacher gets 1 point. Most points wins! The next slide summarises the formation of the Near Future and the following slide looks at the conjugation of aller. The last 3 slides can be used for a re-cap at the end of the lesson or the beginning of the next lesson. You may then wish to use my Battleships Game/ Lotto grid to consolidate this knowledge. me/te/se/nous/vous/se coucher de bonne heure. Firstly I ask the students to work independently in pairs to translate the expressions and discuss the pronunciation. I then check the translations and drill pronunciation with the whole class before they play the game. The students secretly choose 5 squares on the top grid and then try to guess which 5 squares their partner has chosen, filling in the bottom grid with “hit” and “miss.” To choose a square say a phrase from the horizontal line and complete the sentence with a phrase from the vertical line. Where the 2 phrases meet up is the square you have chosen. This resource is aimed at students learning French. It contains clear recordings I made (I am a French native speaker). I prepared for you a recording at slow speed and another one at normal speed for student differentiation. There are also listening questions sheet with the answers, reading questions with the answers as well as the translation into English (I use it for my higher levels to translate into French). A fun listening game is included: you can use it either as a pre-listening activity or as plenary to finish the lesson on a high note. In my shop fgibbison you will also discover many fun resources in French, English, German and Spanish. I would love to hear how you got on with this resource: Thank you for leaving a review. 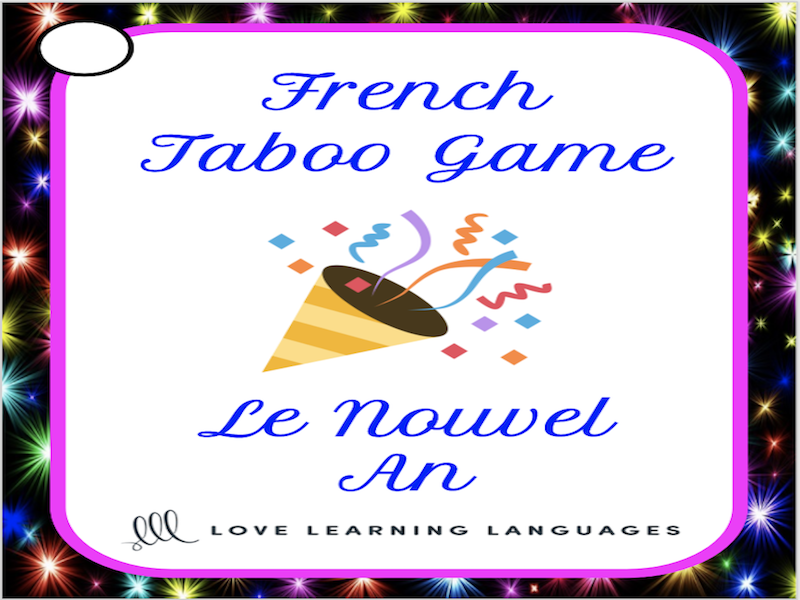 Play this French New Year's - Nouvel An Taboo game and have some fun! Playing games and having fun is when learning really happens in French class. I love to play the game Taboo with my students. French taboo is a game that is easy to modify and use with beginners and advanced students alike. One player tries to get his teammate to guess the word at the top of a card. The player must give clues, but he can't use any of the Taboo words in his description. The taboo words are written beneath the underlined word at the top of the card. Teams score points for each word successfully guessed. The team with the most points at the end of the game wins. Beginner students should be allowed to use the French TABOO words printed on the cards. This will encourage them to use new vocabulary and will help them in forming sentences to use as clues. Practice the future tense in German while talking about New Year resolutions or talk with your class about holiday traditions with these presentations and worksheets. The power points helps to introduce vocabulary to talk about new year traditions in Germany. Words are presented individually and in context. Pupils can be encouraged to make up their own sentences, compare with what they do on New Year's Eve or even create a Silvester poster for the classroom. The worksheet can be used for extension and to stretch some more able pupils. Please feed back. Danke und ein gutes neues Jahr! There is a card sort of 16 resolutions. There is also a word cloud with 27 resolutions which is ideal for translation work. All resources use high frequency vocabulary. They act as a perfect platform for pupils to create their own resolutions. I also include the Word file I used to create the word cloud if you need to edit for your own purposes. In this reading, a young man is discussing his plans for celebrating New Year’s Eve in Germany with his friends. He also talks about his New Year’s resolutions. A lot of this reading is in the future tense using werden + infinitive. This reading includes a glossary of new vocabulary, five short answer questions and a guided conversation practice. Activity idea: Have students read together and then answer the questions. They can then discuss their plans for the coming year in the future tense! Encourage pupils to talk about their plans for the new year in Spanish using these lesson activities, and incorporate the holiday spirit within the material you make with these fun clipart images. Whole lesson activity for pupils to learn how Christmas and New Year are celebrated in Spain. Includes posters which I stick on the walls and questions for pupils to answer in groups by going round the room reading the posters. Vocab sheet is included. Also a picture sheet for pupils to say what date the picture corresponds to, after having read posters. 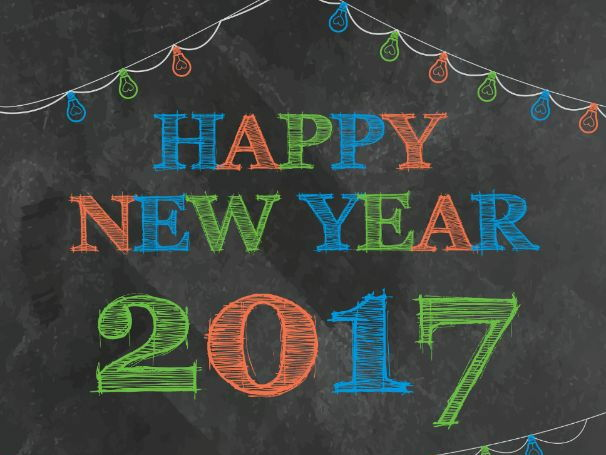 This resource, aimed at KS3 Spanish students, recaps the near future in the context of new year’s resolutions. 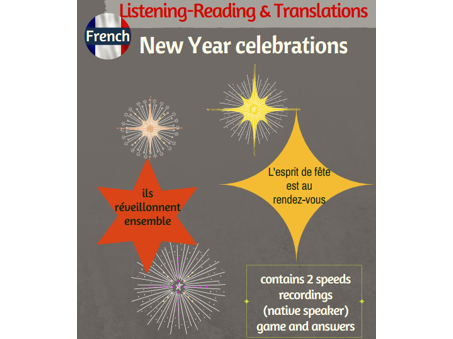 Introduces 12 new year’s resolutions phrases and practises these with a quiz, translation activity and catchphrase activity. Also included are further activities: snakes and ladders (speaking), battleships (speaking) and strip bingo (listening). Includes three differentiated worksheets. (Teacher’s notes and answers to exercises included). This 4-pages-long resource is perfect to start off the New Year! 1. A worksheet where students must summarize their last year by telling what they most enjoyed, something new they have learned, the places they visited, etc. 2. The second worksheet includes a survey which can be done in pairs or small groups where students take stock of the most popular events of the year: the best Spanish song, the best Spanish film, the Spanish word of the year, the best electronical device, the news of the year, etc. After doing some research and completing this worksheet I asked my students to do a short oral presentation on the year 2016 with the information they had found. 3. In the last worksheet students write their New Year resolutions in Spanish regarding work, studies, family, travelling, health, free time, etc. After completing this exercise, teachers can ask students to write full sentences using the future tense, for instance. The worksheets have an inviting and motivating design and all the instructions are written in Spanish. They are ideal for students who have an intermediate or upper-intermediate level of Spanish. If you are looking for extra New Year activities to have fun with your students, this varied resources will definitely make a difference in your lessons. Please, leave a comment after downloading! Thank you! Visit my TES shop, THE SPANISH WORKSHOP, for tons of great Spanish resources. Sales are awaiting you every week! Please take a moment to provide me with your high quality feedback that will help me improve. Enjoy these high resolution digital images for "The New Year"